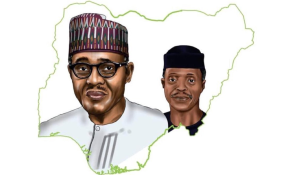 President Muhammadu Buhari, and his deputy Yemi Osinbajo. He noted "We have promised Nigerians three major issues concerning our survival as a nation citing fight against Corruption, security and economic revitalization. In these areas " I will like to boldly say that we have delivered our promises to the electorates adding that if you like you can asked those that came from the North East since they use to come to Kano to do business most them have since returned to their houses and we see that as a significant development "
He noted "it is a thing of pride that today Nigeria is cultivating Rice to feed herself locally. We have subsidized the price of fertilizer for our farmers to embarked on mass production of food to sustain growth and development throughout the Country." Buhari said his administration had done a lot in blocking leakages and introducing the single treasury account policy in order to put the country's resources in one basket.
" I have been a governor, minister, of petroleum, head of state there is nothing I want to achieved beyond ensuring that Nigeria become a peaceful and United country" he added. On his part, chairman of the All Progressive Congress, Adams Oshiomole dismissed insinuations that his party is planning on rigging the elections saying they don't need to rig the elections. According to him,the party has no need to rig the elections as they don't have the know how to rig elections rather they have the know how to dismantle the rigging machine of the opposition. "How can Atiku say he will create jobs when he presided over industrial obituary when he was the vice president. If he has short memory like a chief judge, Nigerians don't have," he said. Director General of the campaign organisation, Rotimi Amaechi dismissed claims by the vice presidential candidate of the PDP, Peter Obi that APC didn't spend a dime to complete railway projects. He aver that if the PDP finished paying for all the railway projects why they didn't finish and commission them before leaving office. Speaking earlier, Kano State governor, Dr Abdullahi Umar Ganduje told the mammoth crowd that the state is President Buhari's strong hold and Kano politics is about him and him alone. Ganduje stated further that the President had done a lot for the state citing the Lagos- Kaduna - Kano under construction saying" when he came to Kano we asked him to construct Kano -Kaduna -Suleja road. And as you can see work had since reached advanced stage.